Scheduling a practice on the SI Play system allows a coach to reserve field time, notify the team participants, track attendance, and allow participants to view the events on the team schedule. 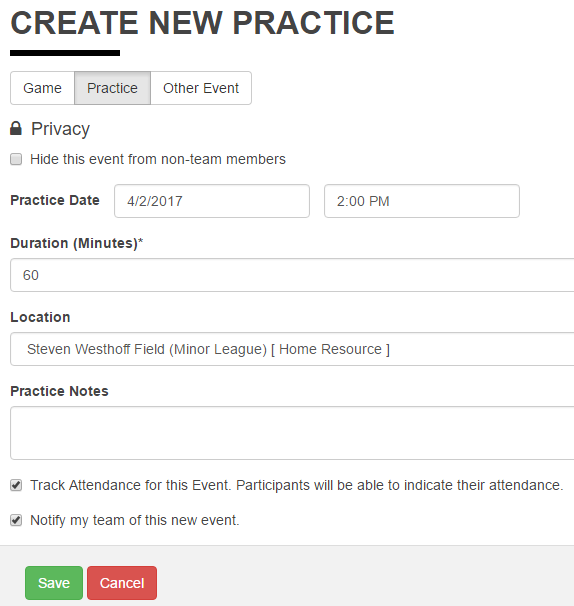 Practices can be schedule on the team website, and upon creation will notify the coach on any overlapping field usage at the facility. Practices can be scheduled on the SI Play App, but at this time the App does not validate field conflicts, so the team website should be used. Browse to your team website and login. If you do not know the address of your team website, you can login at SkilesTest.com and reach it through your account or you can browse for your teamon the Teams Page. 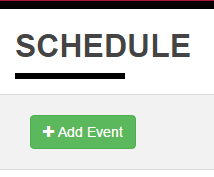 Open your team schedule, and select "Add Event". On the create a new event page, select "Practice". Leave all events public and visible (do not hide from non-team members). Select your practice date, time, duration, and location. To reserve a field or facility, select a predefined location. The system will confirm if you want to send a notifcation to your families. 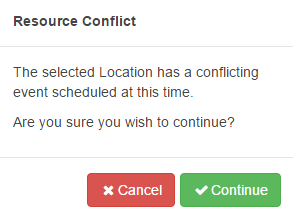 If a scheduled event already exists on your resource you will be alerted. The system will allow you to overbook the field, but do not do that. If you are alerts, select "Cancel" and it will take you back to change the event; choose a date and time the facility is available.